Wow I cannot believe its already been 1 month. Miko has settled in nicely and has become part of the family. We have accomplished a lot in one month and just wanted to give everyone an update on the pros and cons of living with her. First let me say she is a VERY friendly dog to humans and other dogs. She has been provided with many social interactions with other dogs and every play date or encounter has gone really well. She has had a play date every weekend with the likes of a Boston Terrier, Border Collie, Pit Bull Mix, and Greyhound Mix. In addition to the play dates, she is going on her third week of puppy classes and loves to play and chase the other dogs during off leash time. 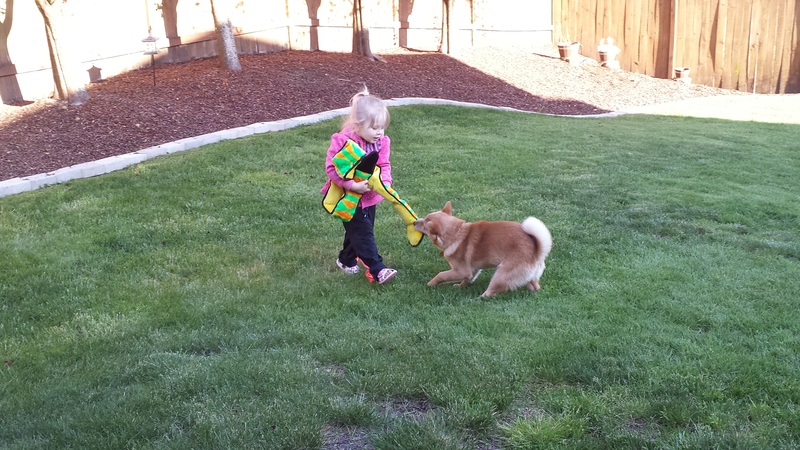 She tends to want to play with the bigger dogs more and does not back down from them. She is a very sociable dog. Friendly with everyone and everything she comes into contact with. Crate trained. Have not had any problems with her in a crate. She sleeps through the night no problem and only use the crate for sleeping at night. The first few night we had her crate up in our room but it seemed to be too hot, so we moved her downstairs and it much better. She is very good in the kennel as well but only use the kennel if we are gone for a short period of time. Potty training. This was one that I was worried about. It has been much better than I could have ever hoped for. Because Lindsay had her going to the bathroom outside in a pen, I went to home depot and bought one for outside. She would use it for a few days to go to the bathroom but after that she is all yard. Sometimes I might put her in there if we want her to go and usually within a minute she has done her business. She has now got to the point that she will go over to the door when she wants to go outside but as of today, we installed a doggie door for her. Vet Visit. Wonderful experience. This was 2 weeks ago and she got on the scale and weighed in at 18.6 lbs She loved everyone who worked there, did not give any fuss and was a good girl for her exam and shot. They said to bring her by anytime just to say "Hi." Riding in the car. I put her in the back of my Subaru Outback and she would stand up and look out the window or just lay down. Honestly, you wouldn't even know she was there. I then moved her to the backseat and she seemed to have a little trouble standing up while driving so I put her in the passenger seat (see picture) I love having her as my co-pilot as I think she prefers the far back the best or the front passenger seat. 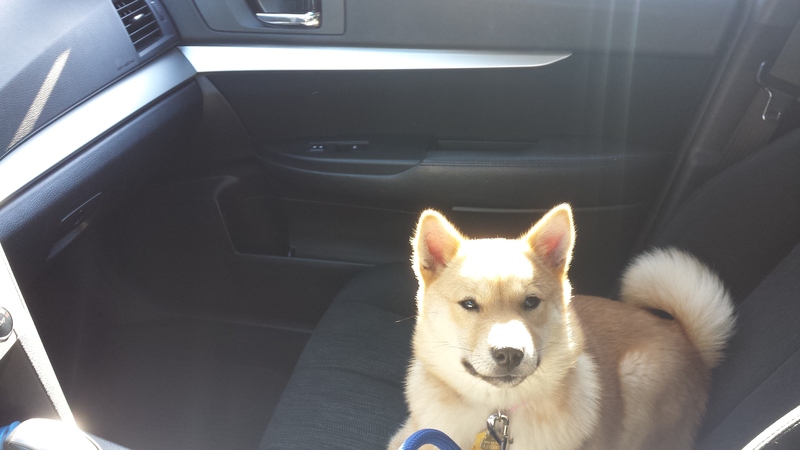 She has never tried to jump between seats or in my lap while driving. Puppy classes. Probably the best decision made. The lady who teaches them raises Akitas and she is wonderful. 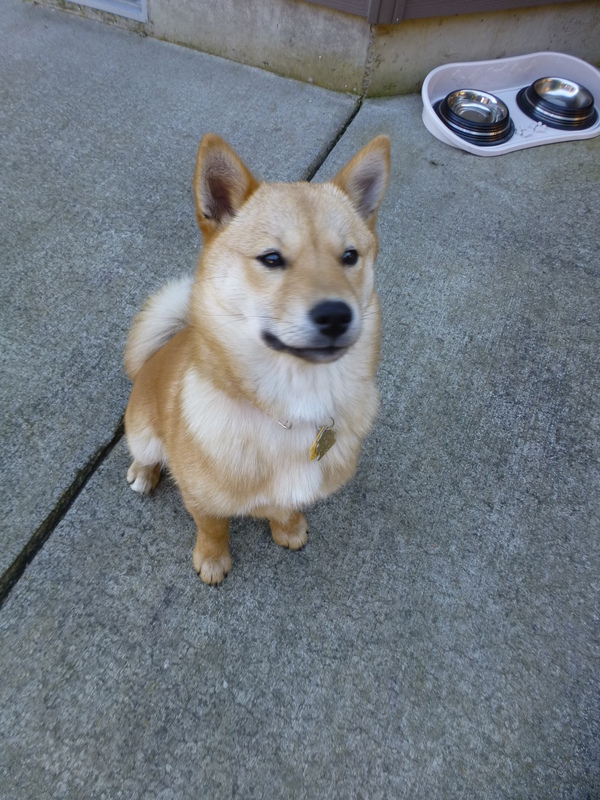 Miko has responded well to training and follow commands most of the time without food. (But of course it helps) She does great in the class and loves to play with the other pups. She was a little shy at first but warmed up really quick. The Humans. She seems to love us so much she goes crazy. She is practically my wife's shadow. We have become so attached to her that we miss her throughout the day and always look forward to coming home to see her smiling face and to get puppy kisses from her. Mouthy/Bitey. Being a puppy we expected this. She only seems to really do this when we haven't seen her for a while like first thing in the morning or one of us gets home from work. She is so excited to see us she goes crazy and wants to lick and bite. We have been working on pushing away on her muzzle and redirecting her to something else. Chewing. Another puppy trait. She has chewed on a few things we did not want her (furniture etc) but we have moved stuff out of the room and put plenty of chew toys, etc to keep her distracted and occupied. Digging. She likes to dig. She likes to dig in the bark dust, the grass, dirt, etc. 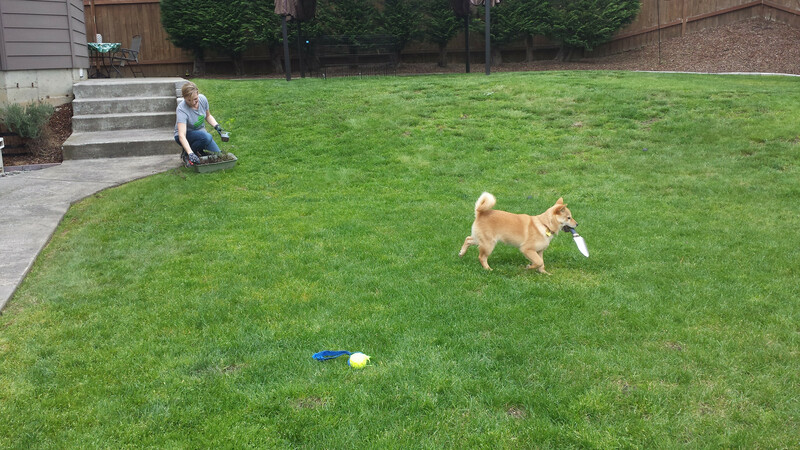 It all started when she helped my wife plant herbs and pull weeds in the backyard (see picture of her carrying the hand trowel) We try to redirect her with this habit too. Leash Training. We have been taking her for walks and she likes to pull. I mean pull a lot. to the point she is choking herself out. She is getting better though as we get her to stop and sit. She also likes to run. Since my wife is a runner if she runs in front of Miko she will try to keep up and not get distracted. The next set up puppy classes are all on a leash so we will be attending those. She likes her sticks. If she can find a stick she will put it in her mouth. We have just tried to make sure there are none in the yard. The Cats. This is in no way her fault but the cats want nothing to do with her. She gets very excited when the cats are around and wants to investigate and smell them. The cats get pissed off, hiss, growl, and swat at her. She gets crazy excited and I have to separate them. I still have hope that they can co-exist peacefully someday. thats all for now. We are all really happy with her and can't imagine not having her in our lives. Awwwwww she's so cute! I'm glad to hear she's doing so well with you. Potty training was easy with Meitou, which was nice. He thought the cat was scary at first but he got over that after a while. And last year he got introduced to a returning cat (I brought it up in a thread about cats on here somewhere, I think). He does fine with our cats, but he'll terrorize strange cats. Walking with him was hard at first because after a couple weeks he decided everything outside was scary so we had to work through that. She looks great, everyone here misses her too. Very nice to see how happy she looks! 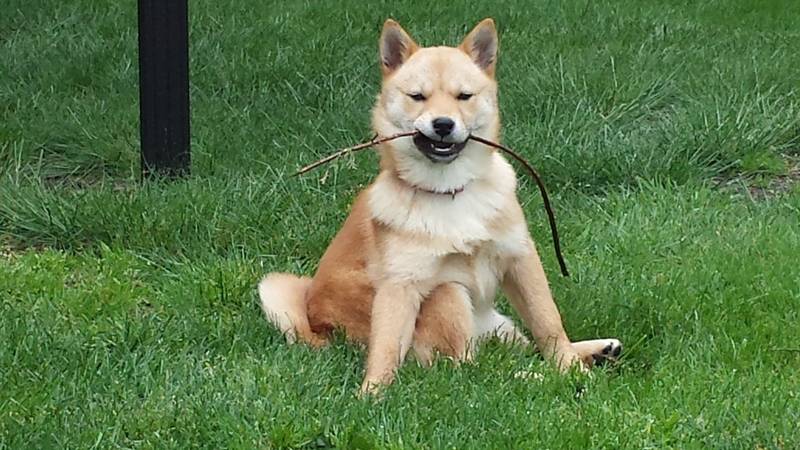 She is so cute :x I love the expression in the photo with a stick in her mouth! Kirin (8 months) is still going through the bitey stage, same as with you it's when she hasn't seen me for a while and will jump and bite at hands or grab the back of a trouser leg or your sleeve. You can tell she's not doing it to hurt but just over-excited, I am trying the 'turn around and ignore her' approach at the moment and also the 'yelp like a puppy' which seems to get her attention. We also have the 'doesn't back down' thing, they don't seem to care whether the dog is smaller or 10x bigger than they are, they will always have the last word! Kirin is a total dustbin with food. 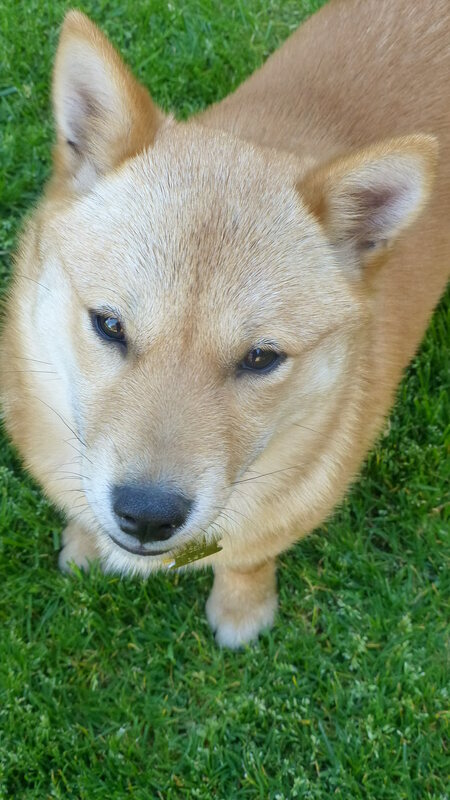 If it looks remotely edible then it will be eaten lol, but glad you have found something that Emiko likes! Thanks for the upate. :) She looks so adorable. 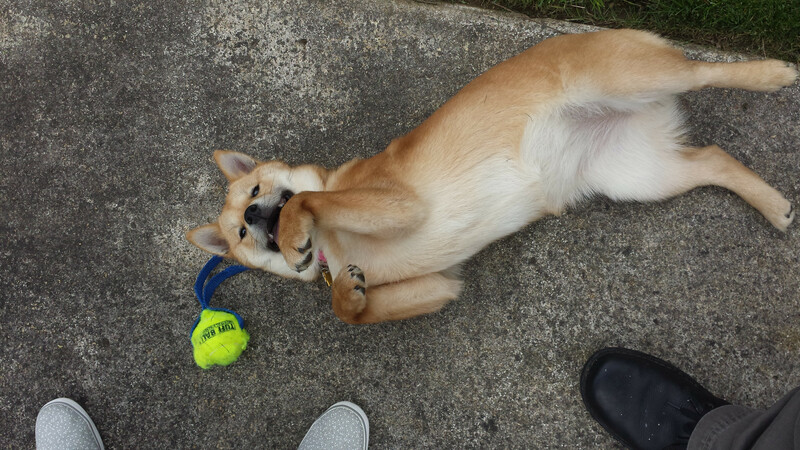 Saya my shiba used to bite when she got very excited too like when someone she liked came over or my mom came home from work. I found having mom ignoring her helped some also I would try to grab a toy and give her that to carry. 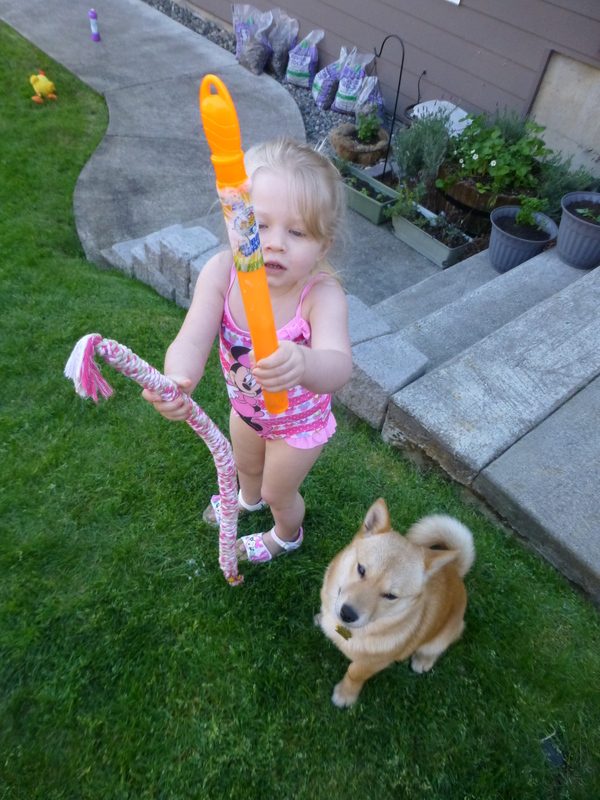 Eventually she got in the habit of running to find a toy to show people. 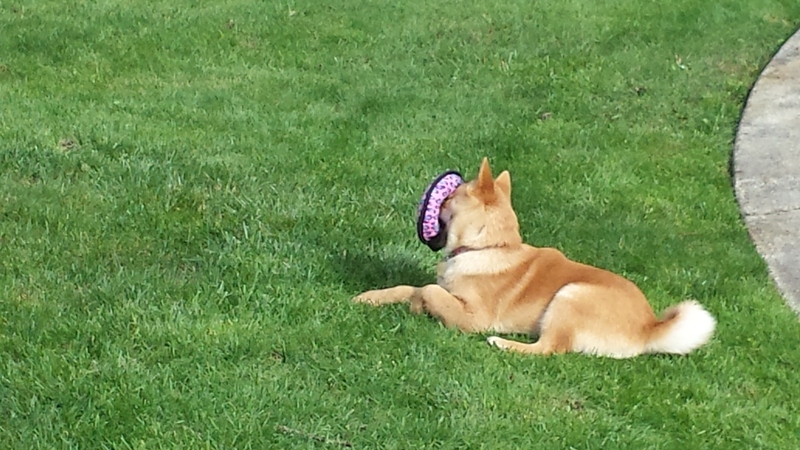 She would put her ears down making playful shiba noises. She got better about the biting once in while she'd get way excited, but as she grew she eventually stopped. Keep up the good work can't wait to see pictures as she grows. Love hearing about hokkaido hope to have one someday so I look forward to learning about the breed. Sounds like she's doing great :) looking forward to pics as she grows!